The Ghana National Health Insurance Scheme (NHIS), set up in 2003, is arguably the most important social intervention in the health sector in the country’s history. Since its inception, hospital attendance has quadrupled with NHIS members now constituting nearly 90% of all OPD clients at facilities. This has been made possible by a strategic move by the country to switch to a national insurance system signified by a single purchaser and a single pool for the benefit scheme. In essence, Ghana has defragmented its health system and created for its citizens an equitable benefit package for all members without distinction. However, uncontrolled cost escalation, delays in reimbursements, a preference for curative care and logistical glitches have otherwise marred what should have been a model for most African countries attempting to implement UHC schemes. 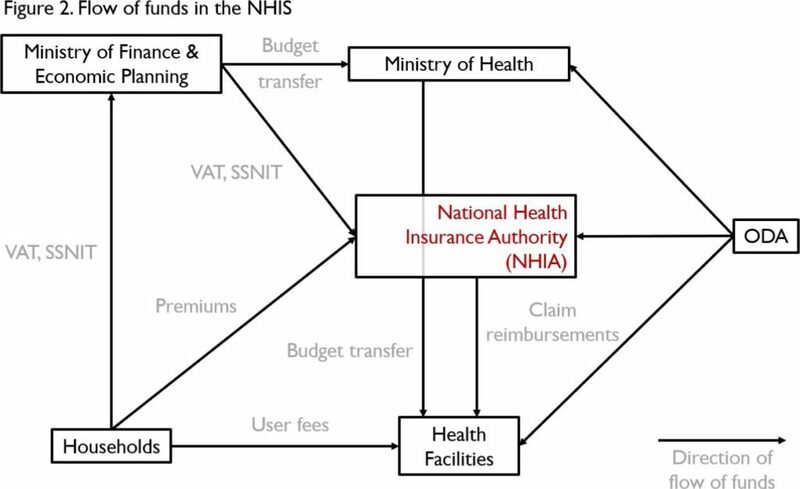 The NHIS by design is open to all Ghanaian citizens and is financed through a 2.5% earmarked VAT, called the NHI levy and a Social Security and National Insurance Trust tax of 2.5%, with the remaining revenue sources being premiums and interest from National Health Insurance Authority (NHIA) investments. However, Ghanaian belonging to the following groups are exempted from paying premiums: age <18 or >70 years; pregnant women; SSNIT pensioners; and the indigent who cannot afford the premiums. Interestingly, over 70% of the population belong to one of these groups and are therefore exempted from paying premiums. This is reflected by miniscule proportion of the revenues which are sourced from premium contributions (Figure 1). 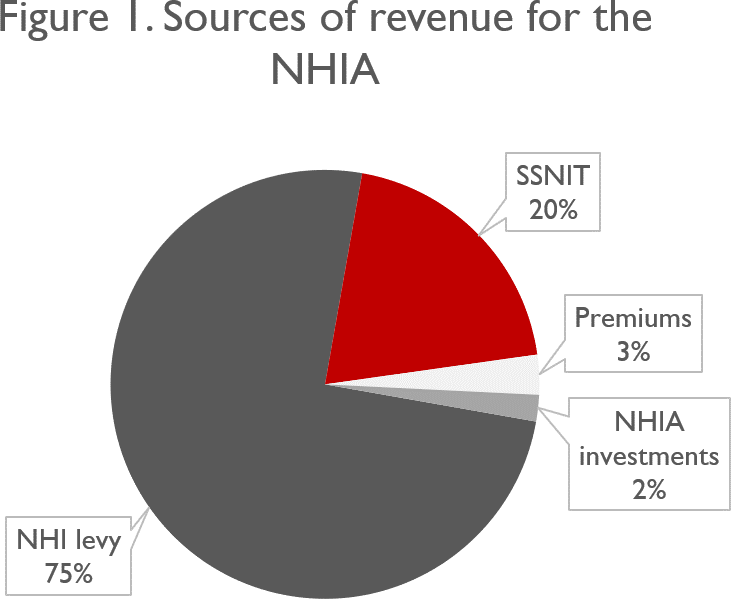 Through this model, NHIS revenues have been tied to the economic development of the country. At the same time, however, by excluding a large portion of the population from paying premiums, the revenues are not linked to expansion of coverage, raising concerns regarding the sustainability of the program. The NHIS covers over 95% of all diagnosed conditions—including in-patient, out-patient, emergency care and pharmaceuticals; exclusions to the list include some areas of specialized care such as cancer treatment (excluding breast/cervical cancer) and dialysis. Further, no co-payments are expected from the patient at the point of care. These provisions only apply to care received at hospitals, however, with the program being somewhat biased against core Primary Health Care (PHC) services such as preventive and basic health services since the NHIA does not pay tariffs or reimburse for outreach services, nor for task shifted activities such as midwives conducting deliveries at community. The scheme initially employed a Fee-For-Service (FFS) mechanism, where providers were paid based on services delivered. In 2008, however, the Ghana-Diagnosis-Related-Grouping (G-DRG) mechanism was introduced with FFS being reserved for medications. Under the G-DRG mechanism, payments for patient care would be disbursed at standard rates based on severity of the diagnosis and not based on the number or type of services delivered. This was done in response to the rampant cost escalation that adversely affected service delivery at hospitals. In 2012, additional reforms tested the effectiveness of capitation methods through pilots in the Ashanti region to further contain the rising costs and settle disputes with providers regarding the tariffs which were set. The myriad issues that plagued the initial implementation of the scheme led to a less than expected coverage, with only 39% of Ghanaians being insured under the scheme by 2016. This was also accompanied by rises in the Out-Of-Pocket (OOP) expenditures, which arose from the increasing user charges or so called co- payments that facilities started imposing on insured users. Needless to say, the OOP in 2015 was still high at over 40% of the Current Health Expenditures (CHE). Essentially there were four flaws with the original scheme, which led to the underperformance of the scheme. First, the benefit package was too broad. Clearly, the supposedly ‘generous’ package did not focus on the key health sector priorities of the vast majority of the population, rendering the scheme inequitable. A general lack of focus on primary care and a preference for higher levels of care, targeted at a select group of population resulted in coverage which was not cost-effective or evidence based. Second, a lack of cost-containment measures exposed the scheme to uncontrolled cost escalation. A preference among the providers to source medications in the open market, combined with an increased patronage at private hospitals (90% of all in-patient claims) where the tariffs were on-average 35% higher than in public facilities and a focus on higher-order care which caused needless referrals led to the costs outpacing the growth in revenues, especially since revenues were not tied to growth in coverage of the program. Third, the quality of care afforded was seriously affected. Budgetary issues and administrative inefficiencies caused delayed and fractioned disbursements of claim settlement, which in turn led to providers being forced to charge informal user fees. Also, since primary health centers were not covered under the scheme, most of the facilities at this level were left ill-staffed and equipped. In the end, beneficiaries were severely affected due to the resulting long waiting times, and frequent shortages of drugs. Lastly, Ghanaians wishing to enroll in the program had to endure the bottlenecks created by the cumbersome biometric registration process which resulted in long waiting lines and queues for registration, sometimes lasting days. This also raised issues regarding the capacity of the system to respond to much greater numbers of the population wanting to join the schemes, especially after the subsequent reforms which greatly improved access to the program. In 2016, a Presidential NHIS Technical Review Committee was formed to analyze the scheme and develop recommendations to address the many concerns raised. The committee suggested a shift of focus to primary health care, based on the rationale that a scheme which is funded primarily by public taxes must not focus on a select group of low-volume/high-cost procedures. Any higher-order procedure would be accompanied by co-payments to control costs. Essentially, the proposal aims to provide “coverage for all but not coverage for everything”. Additionally, a strategic purchasing approach would be adopted with the NHIS leveraging its superior purchasing power to negotiate prices of drugs, which would otherwise be sourced by providers from the open market. 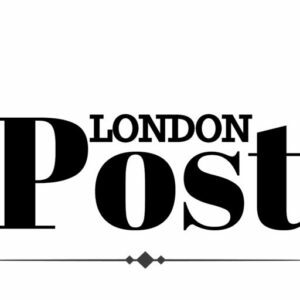 Also, to further intensify the cost-containment measures, a move to provider network systems would be considered to vertically integrate care delivery and exploit the associated economic, financial and managerial efficiencies that would be gained by the process. Further, a nationwide rollout of capitation payment mechanism would be instituted. Lastly, to ensure quality, a Patient Protection Council (PPC) would be created. This would function as an independent body to address quality of care issues, medical errors and investigating other complaints. 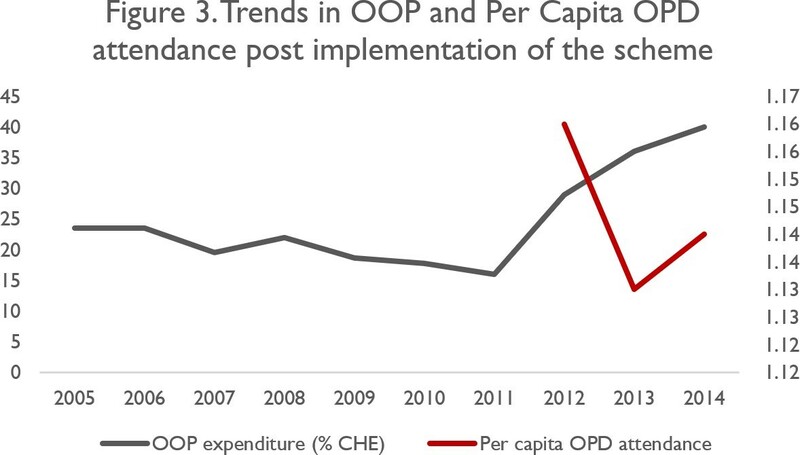 While it is too early to comment on the effectiveness of these measures, preliminary results from the World Bank indicate a drop in OOP expenditures in Ghana, which provide a satisfactory indication of the success of these efforts. The issues faced by the Ghanaian health insurance system serve as anecdotal evidence of the myriad issues faced by countries worldwide, in their quest to achieve Universal Health Coverage. The reforms which have been suggested are evidence-based and address issues of financial sustainability, through a focus on primary level care, a preference for low-powered payment mechanisms, and an integrated provider network system. These recommendations essentially highlight the importance of cost- containment measures in the design of national health insurance schemes around the world. It is clear that countries can no longer address the issue of financial sustainability by matching rising costs through ineffective revenue generation and budgetary reallocation activities and hence it is imperative that Ghana’s efforts serve as best practices in this regard, so other countries can incorporate cost effective strategies and ensure long-term sustainability of their programs.